Like a lot of people, Intertops Casino was one of the first online casinos I ever played at. they've added lots of new games from Realtime Gaming over the years but it hasn't changed its look in quite awhile. Until this week! They've just re-launched their website with a modern new look and an all new Instant Play casino. Their download casino has also been given the same new look. The new instant play online casino requires no download or installation so players can be enjoying their favorite games in seconds. There are around 90 of the newest and best slots from RTG as well as dozens of video poker games and a complete selection of table games like Roulette, Blackjack Pai Gow and Baccarat. New Look Bonus up to $500 available until February 28th. The new website makes it easier to browse the growing game selection and to keep track of current bonus offers, like the introductory bonus for the new Megaquarium slot. Megaquarium is a coral-reef themed game with a series of bonus games that culminate in a Mega Bonus game with lots of extra Wilds and random prizes of 5X to 500X the triggering bet. Until February 28th, players can claim an introductory deposit bonus up to $900 that includes up to 77 free spins on the new game. Visit Intertops’ new website on a smartphone or tablet and you'll be automatically re-directed to the special casino lobby for mobile devices. Mobile casino games, with their big buttons, are designed especially for the smaller screens of smartphones and tablets. To celebrate the re-launch of its website and the re-design of its casino, Intertops Casino will double a deposit up to $500. 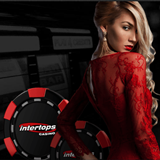 Intertops has been one of the most trusted online casinos for nearly 20 years and is known all over the world for its excellent customer service and generous casino bonus offers.